Polaris - ZineWiki - the history and culture of zines, independent media and the small press. 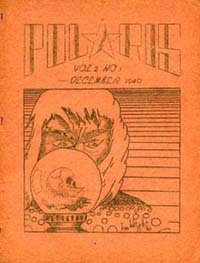 Polaris is a fanzine published by Paul Freehafer (d. 1944) in the 1930s in Payette, Indiana, and later in the 1940s in Pasadena, and then Los Angeles, California, U.S.A.
Six issues were published of this zine between the years 1939 and 1941. It was devoted to "weird" fiction and stories. Polaris features fiction by Robert H. Barlow (Leaves), Ray Bradbury (Futuria Fantasia), John F. Burke (Satellite), Damon Knight (Snide), Jack Chapman Miske (Chaos, Scienti-Snaps, Bizarre), Bob Tucker (Le Zombie), and Donald Wollheim (The Phantagraph). It also included art work by Hannes Bok. The fourth issue, published in September of 1940, included "The Tree on the Hill" by Duane Rimel, which had been revised by H. P. Lovecraft in 1934, and this was the first publication of it. It is now considered an essential work in the creation of the Cthulhu Mythos. Rimel was a correspondent of Lovecraft's from 1934 till '37. He was also one of the co-editors of The Acolyte. Paul Freehafer, along with Bob Madle (Fantascience Digest), Erle Korshak, Ross Rocklynne, Walt Leibscher (Chanticleer), Dale Tarr, Forrest Ackerman (Voice of the Imagi-Nation), Julius Unger, Robert Thompson, Gertrude Kuslan (Cosmic Tales, The Nucleus) and Myrtle Douglas (Morojo) (Voice of the Imagi-Nation, Guteto), were featured in a photograph affixed to the cover of issue 36 (Vol.4, No. 1), from January 1941, of Le Zombie. During 1941, Polaris was a split zine with Shangri L'Affaires. This page was last modified on 21 October 2012, at 15:10.